From detector development to detailed searches for new physics, ATLAS PhD students publish dozens of outstanding theses every year. Since 2010, a few have been celebrated at the annual ATLAS Thesis Awards. The ATLAS Thesis Awards highlight outstanding contributions to the collaboration by PhD students. The theses awarded can cover any area of ATLAS physics, from contributions to the detector to analysis. 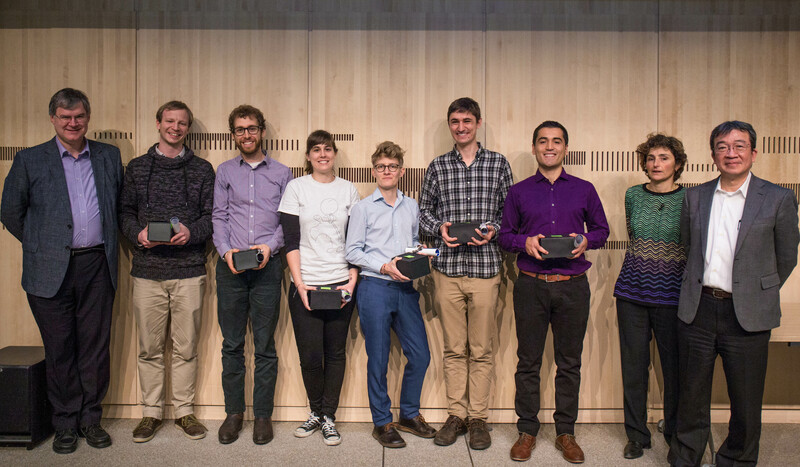 On February 16, 2017, at a celebration in CERN’s Main Auditorium, six winners were announced: Miguel Arratia (University of Cambridge), Kurt Brendlinger (University of Pennsylvania), Lene Bryngemark (Lund University), Joana Machado Miguéns (Lisboa University), Benjamin Philip Nachman (Stanford University), and Matthias Saimpert (Université Paris-Saclay). Following this introduction, each winner was presented with a certificate and a glass model of the ATLAS detector from Spokesperson Dave Charlton, Collaboration Board Chair Katsuo Tokushuku and Thesis Committee Chair Claudia Gemme. The winners went on to give short presentations about their work and experience at ATLAS, each thanking the committee for their selection. Concluding the ceremony, Katsuo Tokushuku urged members of the collaboration to continue to send high-quality nominations – ensuring outstanding winners for many years to come.